This new robot prototype should accelerate the production of ideal plants by walking through unlimited acres, looking at every plant. 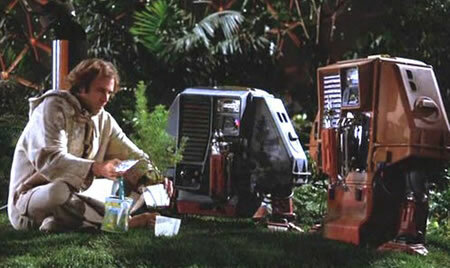 Science fiction films buffs will recall the 1972 sf movie Silent Running, in which Bruce Dern took care of his garden with the help of similar-looking robots. But only on a space craft, not on a county. Consider also the automatic cultivators from John W. Campbell's 1930 story Piracy Preferred. These endless fields of castor bean plants had to be cultivated, but with the great machines that did the work it required but a few dozen men to cultivate an entire county.